I had planned on posting a review of Wake by Anna Hope today but I always find it hard to review books that I really like so that’s going to hang on until tomorrow (or Wednesday, if I am feeling as inarticulate tomorrow as I feel today!) and instead I’m going to sign up for this month’s Classics Club spin. 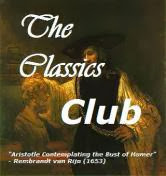 Pick twenty books that you’ve got left to read from your Classics Club List. Post that list, numbered 1-20, on your blog by next Monday. Monday morning [10th February], we’ll announce a number from 1-20. Go to the list of twenty books you posted, and select the book that corresponds to the number we announce. Super simple and (hopefully) a kick in the right direction to topple a second book off my list early doors (is that an English/Yorkshire phrase? It looks odd written out for some reason!). If you could keep your fingers crossed for a number between 1 and 5 and 16 and 20, that would be great. Be kind, Lady Luck!